Beginners/ mixed levels, pre and post natal, and especially ‘Vintage’ yoga students! Bring a water bottle and an open mind; All levels of practice are welcome! Set the pace, with personalized modifications offered to customize your yoga experience from a qualified instructor. Start with an uplifting, flowing series of poses that are for every BODY! Experience bliss in this fun yoga class! All poses (asanas) are demonstrated clearly in several modifications, so that the practitioner may choose what feels best for his or her own body. Learn to utilize our breath, body and mind. Progress safely through a full spectrum of yoga poses and modifications beginning with gentle warm up, building into heat with sun salutations, then move through a fun vinyasa flow. Practice standing, seated balances and gentle twists, Warrior series, modified back bends and an intro into many other poses. Focus your practice on the fundamental basics or push your practice to find your edge while flowing, holding, breathing and sweating. You will leave your mat feeling balanced and strong! 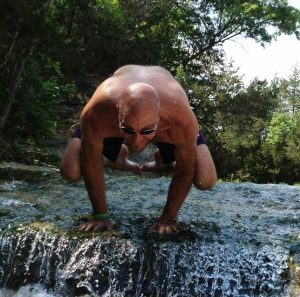 *When weather is nice out we will practice Outdoor Yoga by the Waterfall!